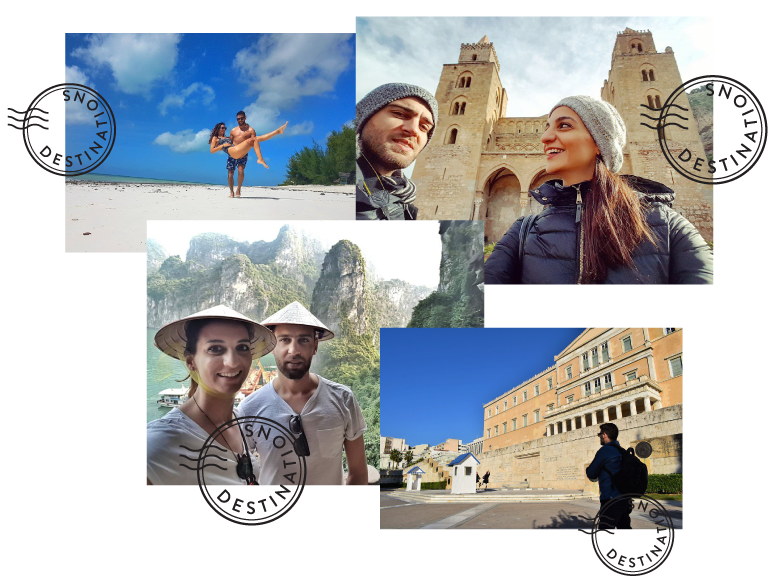 We are George and Vasiliki greek couple from the beautiful island of Crete sharing a common passion for travelling and new adventures. We currently live in the city of Athens and work in the aviation industry! We cannot resist our wanderlust, so we constantly pursue it as well as our passion for exploring the world and getting involved in new adventures. We enjoy good food no matter if it is thai street food or a luxurious meal at a Michelin-starred restaurant. We have a soft spot in travelling by plane, exploring unknown destinations and getting the gist of the knowledge offered to us from every voyage. We usually spend our time reading about travelling or searching for new hotels. But when we don’t, we either enjoy watching movies or revealing our cooking skills. Which phrase describes us best? There has been a lot of dispute over the species in which she belongs to. She must be something between fish (Dori the fish, due to her forgetfulness) and bird, although I have reached the conclusion that she is mostly a type of seabird unable to fly (in real life only, because in an imaginary situation she flies all over the globe). Beyond all shadow of a doubt, she is the largest emperor-penguin ever discovered in planet earth and can be found in all quarters of the world, while, in Asian countries she is widely known as “Vasilis” (which is the male version of her real name, as noone has been able to pronounce her real one correctly in these countries). She feeds mainly on snacks, and by that we mean a wide range from a simple hot dog to a delicious oyster stew with chestnuts. George is what I like to call troubleshooter! He is a typical problem solver! He can keep his cool even when you lose your engagement ring the day before (just saying!). A characteristic motion of his, is the relentless leg shake he does, literally whenever and wherever he sits at! Favorite food…burgers! He is a gadget freak and adores dwandling over Youtube! He does everything with passion or not at all! He can sell ice to an Eskimo (that’s probably how he got me as well!) He enjoys giving romantic surprises and leaving funny post-it notes all over the house. When we travel, his backpack and positive attitude are his priorities. He is obsessed with his hair but he is gradually overcoming it. But… what Yaba really means? It means love! It is a wrd from our own secret dictionary. It’s a kind of couples inside jokes, so this is how we call each other and we love sharing it with you! The birth of our travel site began while we were travelling! While we were wandering around the exotic scenery of Indonesia, among the rice paddies and palm trees, we officially decided to start recording our travel adventures as a couple. It was the time when the need for creativity met the need for endless wandering. This is how Yabatravellers came to being.ανάγκη για δημιουργικότητα συνάντησε την ανάγκη για ατελείωτες περιπλανήσεις. Κάπως έτσι που λες γεννήθηκε το Yabatravellers. Many trips, flights, endless hours spent writing articles and photoshooting followed. And it all happened because we were hoping in the back of our heads, to create a place that would be something more than a plain travel website for planning a trip, maybe something closer to a touch of joy and inspiration as we, ourselves perceive it, for all those out there who promised themselves a life flooded with adventure. Through our very own travel experiences in Greece and the rest of the world, we aspire to “illuminate” the secret sides of travelling, to share tips & tricks, advice, offer travel guides and breathtaking photo galleries with all of you. If promoting your own brand, business or product in a distinct way is what you are seeking, here you will find passion, imagination and consistency! We should first experience and then express our opinion, and this is why, personal experience of the product or the service offered, that needs to be relevant to our blog’s object and the readers’ interest, is really essential.